Lovely. Calm. 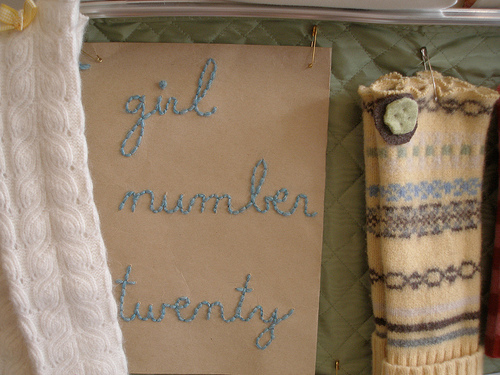 Girl Number Twenty. Thoughtful. Playful. Cozy. Crafty. Etsy. Wise. Mama. Your daughter seems to have a huge influence on your crafting, I’m sure you are inspired by her every day. How did your work and ideas change once you became a mother? MARNIE : The work and ideas only blossomed after Safiya arrived, actually. Pre-Safiya I had been herded daily into an office cubicle, which is not conducive to craft, on many levels. I managed to churn out a couple of Christmas presents annually, but that’s about it. After Safiya, the thought came into my head, as it does with many people I suppose, that “wow. If I can do that, I can do anything!” A hesitancy about my life fell away and I started taking chances. 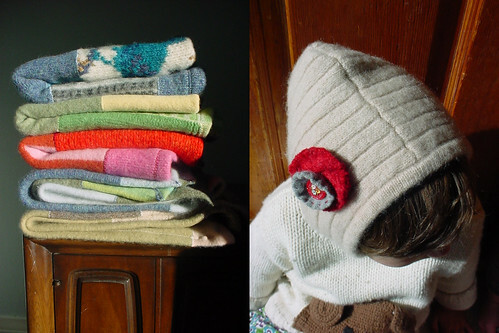 Her energy just started to fill our home, and since being with her, being with kids, is so physical, there was a parallel in my creative life that started to make itself evident: the obsession with the texture of felted sweaters; that everything had to be washable and dryable and natural fibres; the need to be frugal with what I had around the house, yet heap up comfort and well-being simultaneously; all this became woven into what came off the sewing machine and out of my hands. She makes me laugh and she still has that un-self-conscience inner voice that we’re all born with that says “I am awesome!”; it hasn’t been quashed by anybody yet and I hope it never does. Being around that is contagious. Does Safiya make request of things she would like for you to make her? What was the last thing you made specifically for her? MARNIE : Um, dinosaurs? The list changes daily, and is usually accompanied with “you can sew that, right Mama?” I try to make those kind of projects collaborative. The last thing we made was a small, rudimentary, pink stuffed T-Rex, which she sketched on the felt first. We discovered that her craft scissors cut felt better than mine. I really need to get my scissors sharpened. The last thing I made as a surprise for her was a small wool blanket. We were hoping that she would bond with it because since she was a babe her favourite blanket has been a giant acrylic afghan that my grandmother knitted, which has its own suitcase when we travel. I am not kidding. I was so relieved when she loved the new blanket. Taking the bus out of town will be so much easier now. As someone who works so hard to create the smallest possible footprint in this world – What are your goals for yourself this year? Do you have any tips for those of us who aspire to be more conscious of our impact? Everybody is engaged with their environmentally conscience side at a different intensity. I feel weird about giving tips, but it’s a good question, so maybe the best tip I could give would be to really let loose with the creativity. Seems redundant for this crowd maybe, but usually there’s a just-as-beautiful way of doing something using what’s already out there. Make connections. If you draw from nature in your art, make that connection between what you’re using for your supplies and how that impacts the beauty you’re trying to communicate. MARNIE : Anything vegan. From potato-creamy to spiced-lentil to bright-summer-vegetable. I am definitely a soup kind of girl. Today’s was potato/caramelised onion/golden beet/rutabaga/carrot/saffron/chard. It was very yummy. MARNIE : Definitely. Probably felted sweater wool scrap bags, and maybe some fat quarters from my stash, or slim ones, depending on the scrap situation. I’m working on some felted-sweater-seam balls of wool, and another supplies surprise. I love the idea of handmade supplies…. MARNIE : Handmade wool felt slippers, preferably hand embroidered by my husband (no, he doesn’t embroider, but the idea of him with an embroidery needle….) The way to this woman’s heart is through her warm feet. 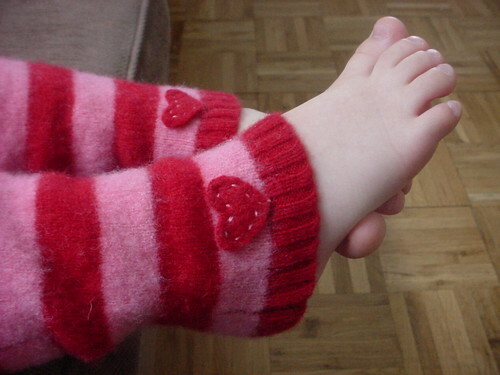 I love the legwarmers! Adorable.